Since 6yo was a small baby, we have read her a story each night at bedtime. This routine has carved a way for 6yo to enjoy reading books and listening to stories. We have learnt that the story doesn’t have to be a long one, it may only take five minutes, but those precious minutes are a great time to bond, and share the day. As she has gotten older, we have used the time for her to help with the reading, picking out some of the words she has learned along the way. Now we have moved onto chapter books, each night time can be taken up with just one chapter rather than a whole book. 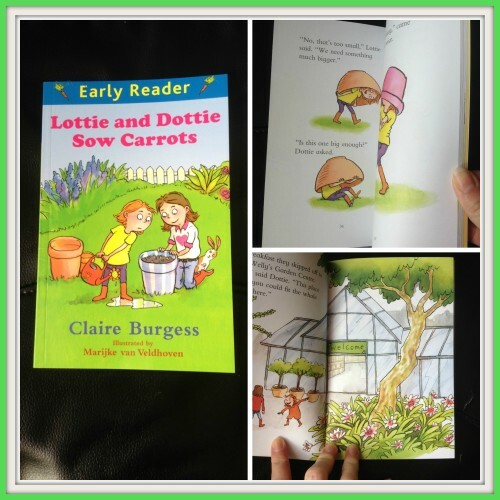 Lottie and Dottie decide to grow their own carrots after visiting Mr McWelly’s garden centre where they learn that carrots taste so much better when you grow them yourself. This is an easy to read book with plenty of bright and colourful pictures which add to the story for an early reader. Published on 17/4/14 by Orion Books. The Railways Rabbits is a six part book collection by Georgie Adams. Bramble the rabbit is adventurous and bored in this book until he hears about the golden eggs and decides to go on an adventure to find one himself. This book is the next stage up from an Early Reader book, but it’s in nice sizeable chapters which make it perfect for bedtime reading. The story is easy to follow and remember when put down. We are big fans of Horrid Henry in this house as you may be aware of. Prissy Polly is getting married to Pimply Paul and Henry has to be a page boy! Can you imagine the trouble Henry can get into during this story! A funny read, with good storyline that relates to both children young and old. This Early Reader version is perfect for 6-8 year olds. Bedtime stories are a great bonding time aren’t they. We seem to have got out of the habit at the moment with Big Mr A working late and me having two to get ready for bed! The bedtime routine definitely needs sorting and I hope to get back to it soon! Bedtime stories are a must here, and if they relate to something Monkey enjoys that’s even better. I love the early reader books there are so many good titles to choose from and you cant beat a little Horrid Henry! My kids always want a bedtime stories! They love to listen!